New to the fair – this Saturday! The kingly Steve Tillotson brings us Banal Pig’s Royal Assortment in time for Saturday’s fair! Isn’t he sweet? Come and give him a hug on Saturday. And the incomparable Andy Sykes presents his new Hexjibber Anti-Revision Book! I have beheld it. It is very, very good. 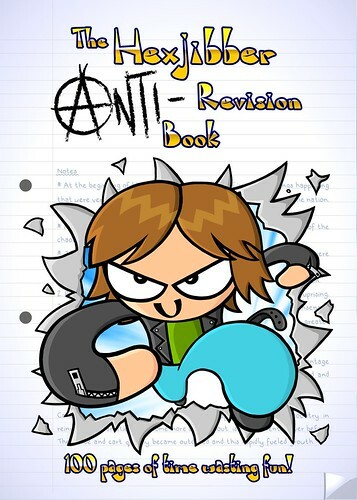 “The Hexjibber Anti Revision Book is for people who want to creatively procrastinate, slack off in style and waste time productively. It’s guaranteed to be 100% free of educational value! All the activities inside are based on the most common subjects you would study at School, College or University. I can highly recommend anything from these boys. Please come along and have a look. Maybe even pick up a copy for that unique Christmas present! Ideal for anyone who likes a laff. It’s gonna be another fun event. And some of us are sacrificing valuable Chrimbo shopping time! So make it worth our while by saying hello! Plus I will be waggling my camera around and hopefully putting together a little documentary of the day!